BEIJING -- Chinese President Hu Jintao on Tuesday pledged a more severe and systematic crackdown on corruption in a key-note speech delivered at a national anti-graft conference. Hu, who is also the General Secretary of the Central Committee of the Communist Party of China (CPC), made the call at the Seventh Plenary Session of the CPC Central Commission for Discipline Inspection (CCDI), a three-day meeting that started on Monday. Acknowledging the progress the commission had made in the past year, Hu said the Party still faced an "arduous fight against corruption". Hu told senior Party officials and the 110 CCDI members attending the session that they should continue to work on investigating "major and high-level corruption cases" and sternly punishing crooked officials. China's anti-graft fight last year led to the downfall of several senior officials, including former Shanghai party chief Chen Liangyu,former Beijing Vice Mayor Liu Zhihua, and former top statistician Qiu Xiaohua. 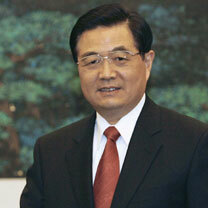 Chen was China's highest ranking official to fall in a corruption scandal in a decade. Hu called on government officials and Party cadres at all levels to establish a comprehensive system to prevent and punish corrupt officials, and to blend anti-graft efforts into the country's economic, political, and cultural developments.